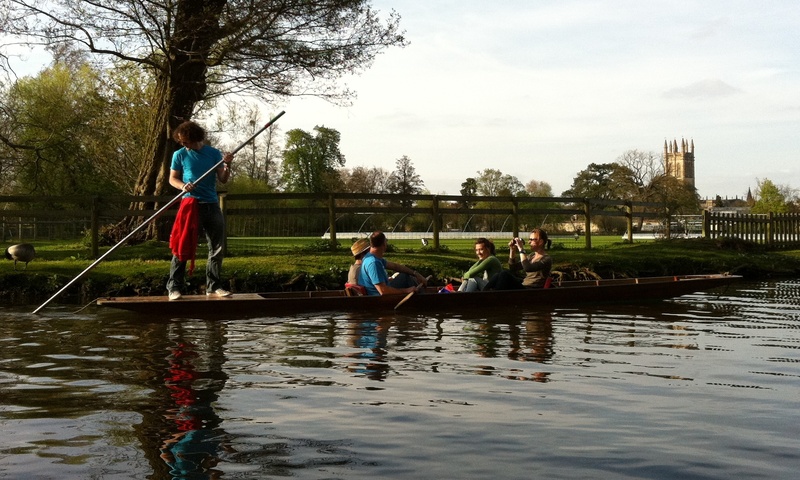 I had my first Oxford punting trip of the season on Saturday. After the rendezvous in Christchurch Meadow and a glass or two of Pimm's, it was on to Magdalen Bridge Boathouse and a brief dispute over who was going to punt us off in front of the gathered crowd (I lost). There's a widely held misconception that punting in Oxford (or anywhere else for that matter) is a relaxing way to while away a sunny afternoon. I can only guess that this ill-founded notion is spread by the lucky folk in the middle of the punt, sitting on their comfortable cushions and quaffing ice-cream. Have you ever had the feeling that everyone on the bank was looking at you? **Newsflash: They are! ** The Isis is just a well-dressed stage and as pole bearer, you're the star of the show. But is it a comedy or a tragedy? Well, that’s down to you and your ability to control a boat with no keel and no rudder. Oh, and you’ve got to do it standing up and under the influence of fruity cocktails. Take it from me, if you find yourself tempted by the romantic of allure of an afternoon of punting in Oxford, don’t be the poor soul left holding the pole.